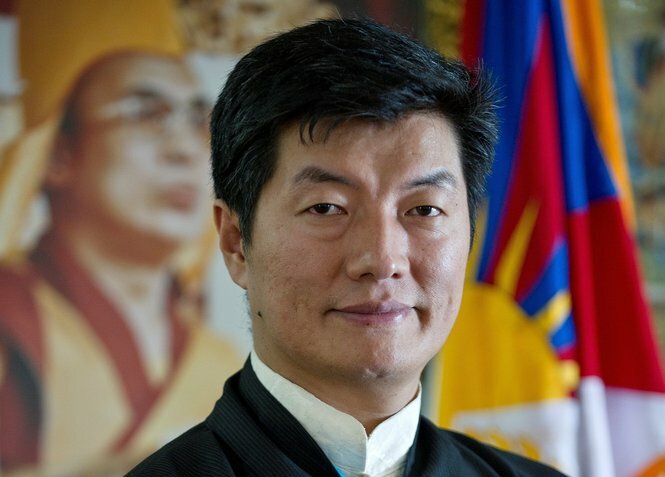 (TibetanReview.net, Nov26, 2017) – The executive head of the Central Tibetan Administration (CTA) at Dharamshala, India, Sikyong Lobsang Sangay, was the guest speaker at the meeting of the All Party Parliamentary Group for Tibet in the UK Parliament after his arrival in London on Nov 22. The meeting was chaired by the Rt Hon Tim Loughton, am member of the ruling Conservative Party, said the CTA on its Tibet.net website Nov 25.The visit concluded his five-nation tour in Europe and North America. Some who question his administration’s removal of the current North America Representative at the Office of Tibet, Washington, DC, have been planning to hold a protest on Nov 27. The report said the meeting was attended by “a number of Parliamentarians” despite the fact that Dr Sangay’s visit coincided with the opening of the parliament’s autumn budget session. The statement said the Tibet Society, the Secretariat of the All Party Parliamentary Group for Tibet, and the Rt Hon Tim Loughton hosted a lunch in honour of Dr Sangay. Dr Sangay was earlier stated to have attended a fund raising reception event of the Tibet House Trust, a UK-based charity, with its trustees. British actress Joanna Lumley was stated to be among others who attended it. The London events concluded the Sikyong’s 17-day, five-nation tour whose itineraries included the capitals of Denmark, Norway, Sweden, and England, besides Ottawa, Toronto and Halifax in Canada. Landing at Delhi on Nov 24, he was hosted a lunch by a delegation of four MPs from the Australian parliament led by Senator Derryn Hinch which had just visited the Tibetan community and institutions at Dharamshala. He will be back at office in Dharamshala on Nov 27, when an assortment of Tibetans dissatisfied with the CTA’s explanation of the grounds for the removal of the current Representative at the Office of Tibet, Washington, DC, will hold a protest rally. The Representative, Mr Penpa Tsering, had assumed office in Aug 2016 and vowed to come out with his own version of the circumstances leading to his removal after handing over office on Nov 30. His Holiness The Dalai Lama and Dr Lobsang Sangay of the Central Tibetan Administration. If His Holiness the Dalai Lama calls for a Phone Protest against Bank of China to Free Tibet, millions of followers around the world will gladly join in calling on a massive scale. Simply call Bank of China 212-935-3101 en mass, jam the phones, and disrupt business until it starts a run on the bank that wreaks havoc on China’s economy. China will Free Tibet or face an economic meltdown. When millions of supporters outside of China call the nearest Bank of China and park on the phones, it crushes the life out of their business, and induces panic among investors and depositors. The Mass Phone Protest starts outside China in cities where people are free to call, and as it builds until it start a run on the bank inside China among 1.375 billion inhabitants who can ill afford to risk losing their money. This is cyber warfare. This a peaceful, non-violent, passive way to protest and bring unbearable financial pressure on the Bank of China and the Chinese government. Your Holiness is in a position to call for a Mass Phone Protest against Bank of China, and bring them to their knees with millions of compassionate calls until China sees the wisdom in freeing Tibet and giving Hong Kong independence. 2. Take your money out of Bank of China; it’s your money. Or call and tell them you’re not going to put your money in their bank. 4. Social network, spread the word globally; it’s your smartphone. 5. When millions of people outside of China start calling, it will go viral, and we will be joined by hundreds of millions of people inside China. 6. As the protest grows and spreads, it will not only interfere with business, it will destroy consumer confidence until depositors and start a run on the bank. 7. The police in China cannot break up an international protest on the phones. China cannot arrest people in the US, UK, France, Germany, Taiwan, India, and down the list for calling Bank of China. 8. What will the ruling party do in China when a billion people inside China start calling and begin to panic and want their money out of the banks? 9. Calling in solidarity with compassion and non-violent, non-cooperation, we can force President Xi Jinping to free Tibet, give Hong Kong democracy, and stop threatening Taiwan… if he wants to save the Bank of China from bankruptcy, stop a run on the bank, and avoid an international economic meltdown. 10. For the first time since the invasion of Tibet, Your Holiness would be in a position of advantage to negotiate. We stop calling when and only when you give the word.